Competition is an interaction between organisms or species in which both the organisms or species are harmed. Limited supply of at least one resource (such as food, water, and territory) used by both can be a factor. Competition both within and between species is an important topic in ecology, especially community ecology. Competition is one of many interacting biotic and abiotic factors that affect community structure. Competition among members of the same species is known as intraspecific competition, while competition between individuals of different species is known as interspecific competition. Competition is not always straightforward, and can occur in both a direct and indirect fashion. Competition occurs by various mechanisms, which can generally be divided into direct and indirect. These apply equally to intraspecific and interspecific competition. Biologists typically recognize two types of competition: interference and exploitative competition. During interference competition, organisms interact directly by fighting for scarce resources. For example, large aphids defend feeding sites on cottonwood leaves by ejecting smaller aphids from better sites. In contrast, during exploitative competition, organisms interact indirectly by consuming scarce resources. For example, plants consume nitrogen by absorbing it into their roots, making nitrogen unavailable to nearby plants. Plants that produce many roots typically reduce soil nitrogen to very low levels, eventually killing neighboring plants. 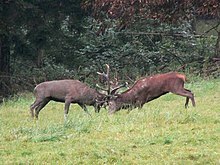 Male-male competition in red deer during rut is an example of interference competition within a species. Interference competition occurs directly between individuals via aggression etc. when the individuals interfere with foraging, survival, reproduction of others, or by directly preventing their physical establishment in a portion of the habitat. An example of this can be seen between the ant Novomessor cockerelli and red harvester ants, where the former interferes with the ability of the latter to forage by plugging the entrances to their colonies with small rocks. Exploitation competition occurs indirectly through a common limiting resource which acts as an intermediate. For example, use of resources depletes the amount available to others, or they compete for space. Apparent competition occurs indirectly between two species which are both preyed upon by the same predator. For example, species A and species B are both prey of predator C. The increase of species A may cause the decrease of species B, because the increase of As may aid in the survival of predator Cs, which will increase the number of predator Cs, which in turn will hunt more of species B. Competition varies from complete symmetric (all individuals receive the same amount of resources, irrespective of their size) to perfectly size symmetric (all individuals exploit the same amount of resource per unit biomass) to absolutely size-asymmetric (the largest individuals exploit all the available resource). The degree of size asymmetry has major effects on the structure and diversity of ecological communities, e.g. in plant communities size-asymmetric competition for light has stronger effects on diversity compared with competition for soil resources. Competition can occur between individuals of the same species, called intraspecific competition, or between different species, called interspecific competition. Studies show that intraspecific competition can regulate population dynamics (changes in population size over time). This occurs because individuals become crowded as a population grows. Since individuals within a population require the same resources, crowding causes resources to become more limited. Some individuals (typically small juveniles) eventually do not acquire enough resources and die or do not reproduce. This reduces population size and slows population growth. Species also interact with other species that require the same resources. Consequently, interspecific competition can alter the sizes of many species' populations at the same time. Experiments demonstrate that when species compete for a limited resource, one species eventually drives the populations of other species extinct. These experiments suggest that competing species cannot coexist (they cannot live together in the same area) because the best competitor will exclude all other competing species. Intraspecific competition occurs when members of the same species compete for the same resources in an ecosystem. Interspecific competition may occur when individuals of two separate species share a limiting resource in the same area. If the resource cannot support both populations, then lowered fecundity, growth, or survival may result in at least one species. Interspecific competition has the potential to alter populations, communities and the evolution of interacting species. An example among animals could be the case of cheetahs and lions; since both species feed on similar prey, they are negatively impacted by the presence of the other because they will have less food, however they still persist together, despite the prediction that under competition one will displace the other. In fact, lions sometimes steal prey items killed by cheetahs. Potential competitors can also kill each other, in so-called 'intraguild predation'. For example, in southern California coyotes often kill and eat gray foxes and bobcats, all three carnivores sharing the same stable prey (small mammals). An example among protozoa involves Paramecium aurelia and Paramecium caudatum. Russian ecologist, Georgy Gause, studied the competition between the two species of Paramecium that occurred as a result of their coexistence. Through his studies, Gause proposed the Competitive exclusion principle, observing the competition that occurred when their different ecological niches overlapped. Competition has been observed between individuals, populations and species, but there is little evidence that competition has been the driving force in the evolution of large groups. For example, mammals lived beside reptiles for many millions of years of time but were unable to gain a competitive edge until dinosaurs were devastated by the Cretaceous–Paleogene extinction event. In evolutionary contexts, competition is related to the concept of r/K selection theory, which relates to the selection of traits which promote success in particular environments. The theory originates from work on island biogeography by the ecologists Robert MacArthur and E. O. Wilson. where r is the growth rate of the population (N), and K is the carrying capacity of its local environmental setting. Typically, r-selected species exploit empty niches, and produce many offspring, each of whom has a relatively low probability of surviving to adulthood. In contrast, K-selected species are strong competitors in crowded niches, and invest more heavily in much fewer offspring, each with a relatively high probability of surviving to adulthood. 1: a smaller (yellow) species of bird forages across whole tree. 3: red dominates in middle for the more abundant resources. Yellow adapts to new niche, avoiding competition. To explain how species coexist, in 1934 Georgii Gause proposed the competitive exclusion principle which is also called the Gause principle: species cannot coexist if they have the same ecological niche. The word "niche" refers to a species' requirements for survival and reproduction. These requirements include both resources (like food) and proper habitat conditions (like temperature or pH). Gause reasoned that if two species had identical niches (required identical resources and habitats) they would attempt to live in exactly the same area and would compete for exactly the same resources. If this happened, the species that was the best competitor would always exclude its competitors from that area. Therefore, species must at least have slightly different niches in order to coexist. Competition can cause species to evolve differences in traits. This occurs because the individuals of a species with traits similar to competing species always experience strong interspecific competition. These individuals have less reproduction and survival than individuals with traits that differ from their competitors. Consequently, they will not contribute many offspring to future generations. For example, Darwin's finches can be found alone or together on the Galapagos Islands. Both species' populations actually have more individuals with intermediate-sized beaks when they live on islands without the other species present. However, when both species are present on the same island, competition is intense between individuals that have intermediate-sized beaks of both species because they all require intermediate sized seeds. Consequently, individuals with small and large beaks have greater survival and reproduction on these islands than individuals with intermediate-sized beaks. Different finch species can coexist if they have traits—for instance, beak size—that allow them to specialize on particular resources. When Geospiza fortis and Geospiza fuliginosa are present on the same island, G. fuliginosa tends to evolve a small beak and G. fortis a large beak. The observation that competing species' traits are more different when they live in the same area than when competing species live in different areas is called character displacement. For the two finch species, beak size was displaced: Beaks became smaller in one species and larger in the other species. Studies of character displacement are important because they provide evidence that competition is important in determining ecological and evolutionary patterns in nature. ^ Begon, M.; Harper, J. L.; Townsend, C. R. (1996) Ecology: Individuals, populations and communities Blackwell Science. ^ a b Sahney, S.; Benton, M.J.; Ferry, P.A. (2010). "Links between global taxonomic diversity, ecological diversity and the expansion of vertebrates on land". Biology Letters. 6 (4): 544–547. doi:10.1098/rsbl.2009.1024. PMC 2936204. PMID 20106856. ^ Barton, Kasey E.; Sanders, Nathan J.; Gordon, Deborah M. (2002). "The Effects of Proximity and Colony Age on Interspecific Interference Competition between the Desert Ants Pogonomyrmex barbatus and Aphaenogaster cockerelli". American Midland Naturalist. 148 (2): 376–382. doi:10.1674/0003-0031(2002)148[0376:TEOPAC]2.0.CO;2. ^ Tilman, D. (1982) Resource competition and community structure. Princeton university press. ^ Holt, Robert D. (1977). "Predation, apparent competition, and the structure of prey communities". Theoretical Population Biology. 12 (2): 197–229. doi:10.1016/0040-5809(77)90042-9. PMID 929457. ^ Van Nouhuys, S.; Hanski, I. (2000). "Apparent competition between parasitoids mediated by a shared hyperparasitoid". Ecology Letters. 3 (2): 82–84. doi:10.1046/j.1461-0248.2000.00123.x. ^ Townsend, Colin R.; Begon, Michael (2008). Essentials of Ecology. pp. 103–105. ISBN 978-1-4051-5658-5. ^ .Fedriani, J. M., T. K. Fuller, R. M. Sauvajot and E. C. York. 2000. Competition and intraguild predation among three sympatric carnivores. Oecologia, 125:258-270. ^ Gause, G.F. (1934). The struggle for existence. Baltimore, MD: Williams & Wilkins. ^ MacArthur, R. and Wilson, E. O. (1967). The Theory of Island Biogeography, Princeton University Press (2001 reprint), ISBN 0-691-08836-5. ^ Pianka, E. R. (1970). On r and K selection. American Naturalist '104' , 592-597. ^ a b Verhulst, P. F. (1838). Notice sur la loi que la population pursuit dans son accroissement. Corresp. Math. Phys. '10' , 113-121. ^ Hardin, Garrett (1960). "The competitive exclusion principle" (PDF). Science. 131 (3409): 1292–1297. doi:10.1126/science.131.3409.1292. PMID 14399717. ^ Pocheville, Arnaud (2015). "The Ecological Niche: History and Recent Controversies". In Heams, Thomas; Huneman, Philippe; Lecointre, Guillaume; et al. (eds.). Handbook of Evolutionary Thinking in the Sciences. Dordrecht: Springer. pp. 547–586. ISBN 978-94-017-9014-7. ^ Brown, W. L., and E. O. Wilson. 1956. "Character displacement". Systematic Zoology 5:49–65.